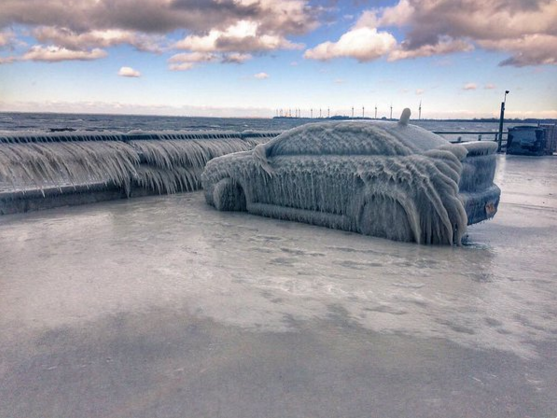 Earlier this week, everyone’s Facebook newsfeed blew up with pictures of the “Ice Car,” a Mitsubishi Lancer encased entirely in ice after being parked on the shore of Lake Erie. Now, the car is finally freed from its frozen shell. John Hickey, a Buffalo News reporter, shared photos of the excavation. They highlight the scene as Lake Erie Towing & Recovery poured salt on the car during the Wednesday morning recovery. The Lancer’s owner Justin Yelen originally planned on using a power washer to thaw through the layers of ice before Lake Erie Towing took charge. Yelen’s car became frozen on Sunday night after he went to Hoak’s Restaurant in Hamburg, near Buffalo, to watch sports. Throughout the night, he went out to check on his car a few times, but it “didn’t seem that bad” at first. By the end of the night, though, his car had become an ice sculpture. The combination of freezing temperatures, high-speed winds, and water coming of the lake created beautiful, yet inconvenient situation for Yelen. When the car finally broke free, it left behind part of its icy shell, reminding Hamburg’s residents to watch where they park.